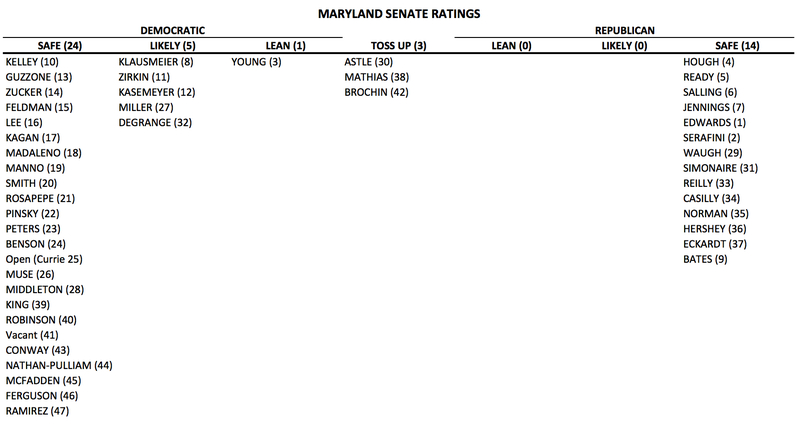 Today, 7S unveils its first set of ratings for Maryland Senate races for the 2018 election. We’re still in the middle of our four-year cycle for state races but politicians are already thinking about 2018 based on the number of fundraising solicitations I received prior to the start of the General Assembly session. Anthony Brown in 2014 and Hillary Clinton in 2016 carried all of the seats classified as safe Democratic. Hogan lost two Montgomery (14 and 15) districts and one Howard (13) district by five points or less, though Clinton won all by large margins. Democrats easily won these legislative districts in 2014 and Republicans lack experienced candidates to challenge them. 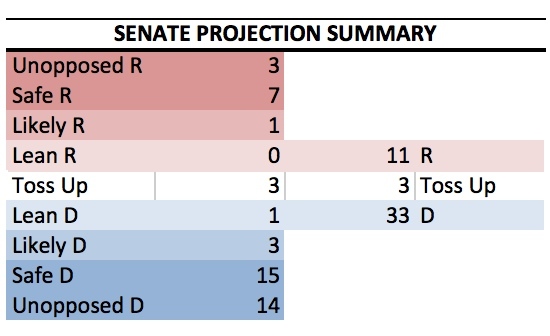 By my estimation, Democrats start the cycle with 24 of the Senate’s 47 seats safely in the bag. For Democrats and Republicans, the fight is not about party control by whether the Republicans can gain enough seats in either house to sustain a veto should Hogan win reelection, as Democrats have been happy to override. Both Larry Hogan and Donald Trump carried all of the districts designated as safe Republican. Democrats lost several of these Senate seats in 2014 but these were low-hanging fruit for the GOP. In D6 (Baltimore County), for example, the miracle in 2014 wasn’t that Del. John Oleszewski narrowly lost the open seat but that he came close at all, as Hogan won by 51 and Trump by 25. 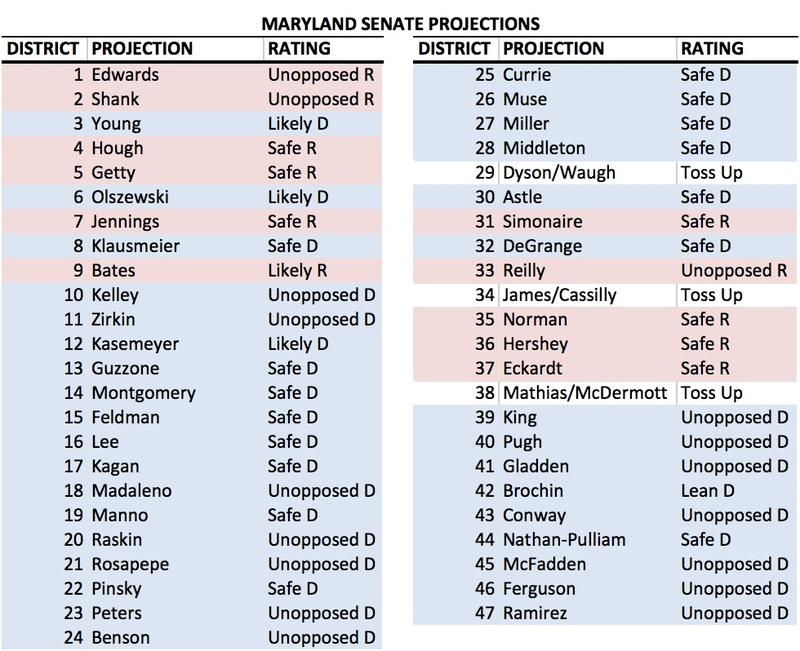 Despite Hogan’s victory in 2014, Republicans performed relatively poorly in Senate races. Democrats won every single district that Hogan won by less than 37 points (!) and two more where Hogan won an even higher share of the vote. No doubt these are the seats where Republicans will concentrate their efforts. Republicans have just 14 safe seats. However, as the Democrats hold the other 33, they have more potential targets. All of the seats that could flip are currently held by Democrats. Three seats held by Democrats will be toss-up races from the start. Democrats will need to hustle to retain these seats. 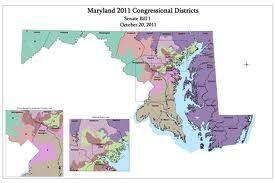 District 30 (Anne Arundel County). Sen. John Astle has already announced that he intends to run for mayor of Annapolis. If he wins that office, Democrats will have an opportunity to help his replacement to settle into the seat. Otherwise, Astle could run for reelection or retire. This seat behaved far differently in 2016 than 2014. While Hogan ran away with the election by 29 points, Trump finished ahead of Clinton by a mere six-tenths of a percent. Incumbent Sen. Astle won with 51.4% in 2014, suggesting a vulnerable incumbent or a prime pickup opportunity for Republicans if he should retire. Hogan will unquestionably outperform Trump but we just don’t know if by less or more than last time, or if he will show any willingness or ability to translate his own vote prowess down ballot. Nevertheless, this is one Democrats will have to fight to keep even if, on paper, it is less vulnerable than District 38. 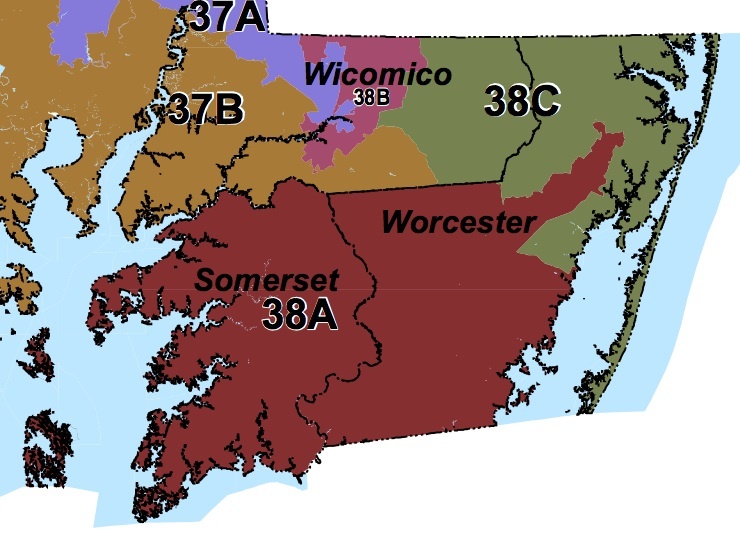 District 38 (Lower Eastern Shore). Sen. Jim Mathias is the only white Democrat elected to the General Assembly from the Eastern Shore due to his incredible political skills and repeated heavy investment by Democrats who just refuse to let go of this seat. Hogan defeated Brown by 40 points and Trump beat Clinton by 28 points in this conservative district. Mathias always faces a tough race and won with just 51.7% in 2014 against one of his delegates. If this popular former Ocean City Mayor won in extremely tough 2014, it’d be an epic mistake to count him out in 2018’s very different political climate. If Mathias doesn’t seek reelection, Republicans would be strongly favored to pick up the seat. District 42 (Baltimore County). Sen. Jim Brochin proudly carves his own path in the Senate. Famous for being mercurial and an undependable vote, he and Senate President Mike Miller appear to cordially loathe one another. 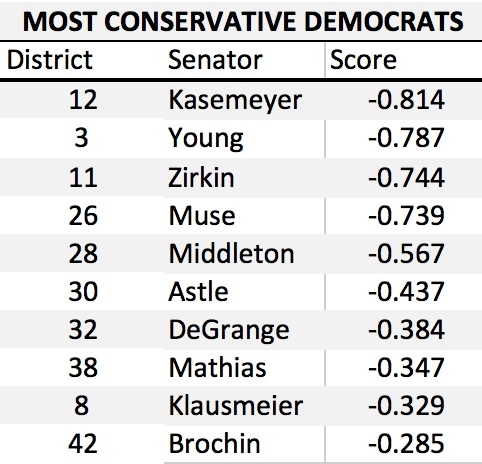 Brochin is the most conservative Democrat, or extreme moderate, depending upon how you look at it. He’s happy to tout his good relations and frequent support for the Governor, who invites him often to press events when other Democrats are given the cold shoulder even if they sponsored the legislation. District 42 has a split personality as Hogan carried it by 42% but Trump beat Clinton by just 2%. Sen. Brochin has defeated strong Republicans in the past (with 51.6% in 2014), suggesting he would be a tough opponent in 2018. It would be interesting to see if the Governor would go all in against his favorite Democrat. Brochin, however, is expected to announce his candidacy for Baltimore County Executive, leaving the seat vacant. His departure would be a boon for Republicans, though not a sure thing. Republicans would have potentially strong candidates in Dels. Aumann or West, though Democrats have Del. Lafferty. 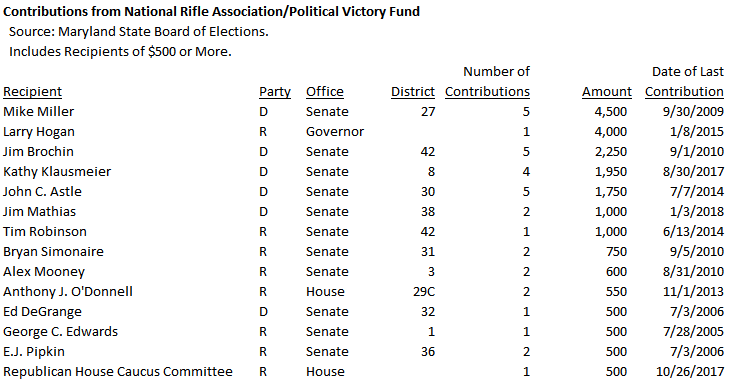 As always, Democrats start with huge advantages in elections for the Maryland Senate. The Republicans have a harder task than in 2014 because they have already won just about all of the natural Republican Senate seats. Moreover, they will face a very different political environment at the national level. No backlash against a Democratic president will bring in a Republican tide. Trump fared exceptionally poorly in Maryland and it’s not hard to imagine him mobilizing angry Democrats. Still, Democrats hold all of the vulnerable seats, mainly due to their past success in winning in different political environments. They should view these vulnerabilities as both a call to action and a potential opportunity to mobilize in areas they need to improve not just in 2018 but also in 2020. 1. Brian Kemmett – Brian is managing the biggest state senate race of the cycle–Jim Mathias’s reelection. In 2010, he was a Regional Field Coordinator for the O’Malley Campaign. That alone justifies his inclusion on this list. Brian was also a Regional Field Director for the state party in 2012 and attended Salisbury University. In between elections, he was a Canvass Director for Progressive Maryland and worked in US Senator Barbara Mikulski’s office..
2. Jake Day – The Salisbury City Council President also happens to be a Veteran and holds Masters degrees from Oxford and Carnegie Mellon. (For undergrad, he was a Terp). He’s also a Lieutenant in the National Guard. Jake has also worked for the Eastern Shore Land Conservancy. He could give Andy Harris a real race one day. He previously served on the City Planning Commission. 3. Josh Hastings – Josh is waging a strong campaign in a solidly Republican district for Wicomico County Council. Currently the lobbyist for the Eastern Shore Land Conservancy, he was previously an aide to Senate Education, Health and Environmental Affairs Committee Chair Joan Carter Conway. Could succeed Rick Pollitt as County Exec one day. Anonymous: Truly a nice guy. Smart & dedicated to the Eastern Shore. 4. Laura Clay – There are very, very few good professional fundraisers in Maryland. Laura is one of them. She did finance on both of Frank Kratovil’s Congressional Campaigns and is now helping Bill Tilghman post surprisingly big numbers in his MD-01 bid. 5. Robby Sheehan– The Director of Government & Community Relations (and Deputy Chief of Staff in the President’s Office) for Salisbury University is one of the youngest people working in Annapolis (provided you don’t include interns), period. He previously worked for the powerful House Appropriations Committee Chairman Norm Conway. Currently working on a Master’s Degree, this guy has big things in his future. 6. Dennis Teagardin – Dennis’s influence extends far beyond the Shore to the Baltimore Suburbs (where he’ll likely take a seat on the Central Committee in July) and to Montgomery County (where he is Delegate Kirill Reznik’s Legislative Aide). However, this Ocean Pines native and Jamie Fontaine protege will forever be intricately tied to the Shore. If there were a competitive congressional in MD-01, he’d be a solid field director. Anonymous: He is president of Baltimore County Young Dems and a candidate for Central Committee for District 11 (he is on the slate with Sen. Zirkin and Delegates Stein and Morhaim). He is currently on the Central Committee by function of being President of Balto County YD. He is generally seen as a potential successor to a Delegate seat in 2018, should one come open, and is active on a number of campaigns and fundraising efforts.